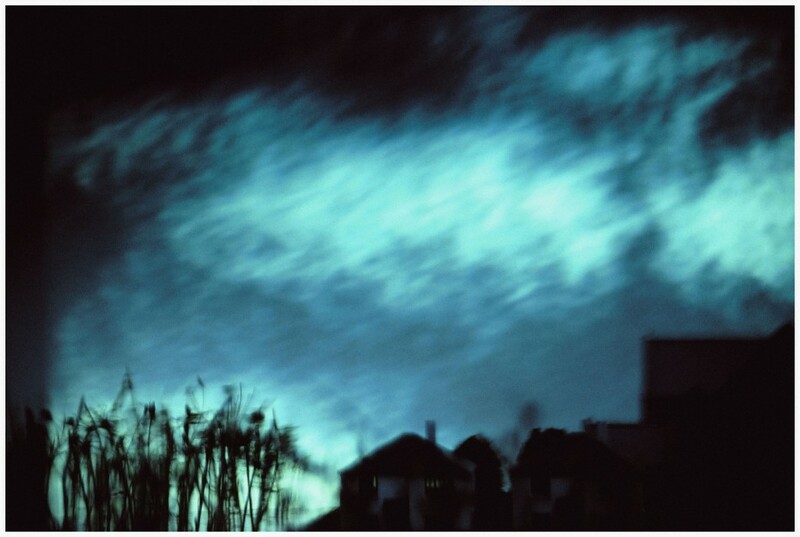 Clair Langan, still from "Metamorphosis" , 2007, 9 min. 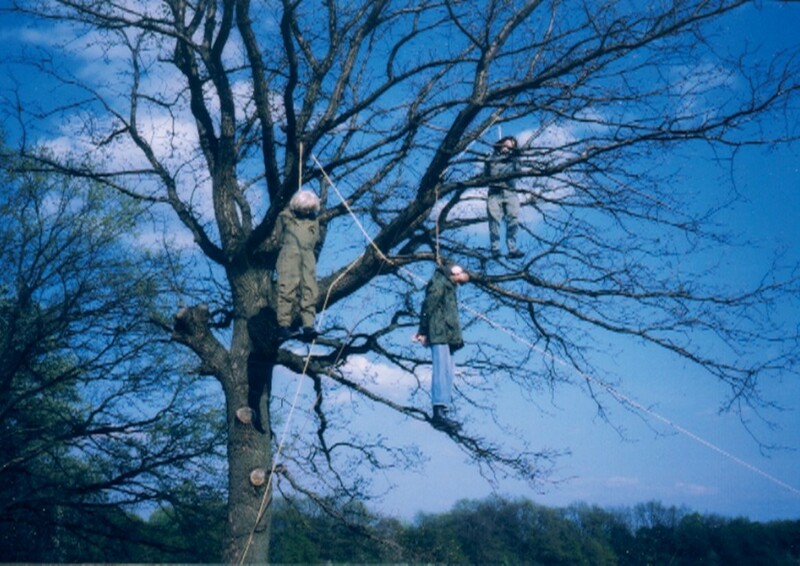 Katarzyna Kozyra, still from "Punishment and Crime", 2002, 1:08:13 hr. Kate Gilmore, Wallflower, 2006-2007, 16:47 min. Shahar Marcus, still from "The fathers have eaten sour grapes…", 2008, 4:04 min. Braverman Gallery is proud to present a new video exhibition featuring work by four international artists who investigate various phenomena that border on the absurd. “Real Thing” offers different perspectives with works that dwell on the abstract nature of reality through their exploration of the physical world. The four pieces address the subject in varying intensities, ranging from intimate domesticity to laden history and from anonymous violence to a universalism that annihilates any sense of individuality. Alluding to nature’s potential for violence, Metamorphosis takes its name from Greek mythology, in which the force is closely linked to change. Clare Langan‘s video examines both the Big Bang and the Apocalypse, reflecting the basic human struggle to survive. Utilizing poetic visuals, both real and imagined (sometimes manipulating the filmed images by hand), Langan whets the viewer’s appetite for traditional landscape imagery, linking this nostalgic desire with nature’s wild, violent manifestation. The pictured landscape is in fact a composite of filmed locations, a model built by the artist and images painted onto the film. Langan’s meticulous creation of a ‘false’ visual is at odds with the viewer’s very ‘real’ encounter. Absurdly, even after the revelation of the falsehood, as viewers we continue to believe in the fabricated scenery. 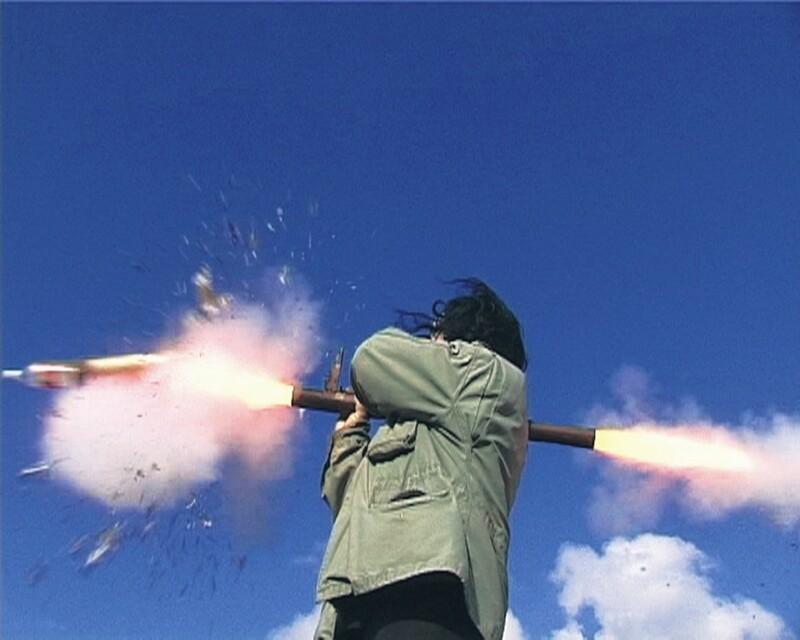 Guns, bazookas, flame throwers, grenades, rockets, rifles: Katrazyna Kozyra‘s Punishment and Crime documents a group of hobbyists who act out war scenes and commando maneuvers in the Polish countryside. All the participants’ personal characteristics are obliterated by feminine wigs and latex masks, and their lack of conversation also reveals nothing. The conventionally beautiful, ill-fitting latex masks, coupled with the acts of extreme violence, present a grotesque caricature of the global acceptance of violence as pleasure or entertainment. Flipping Dostoyevsky’s iconic title, Kozyra observes the absurdity inherent in the alienation between effect and cause. In Wallflower, Kate Gilmore‘s studied ‘rearrangement’ of her personal possessions sees the artist facing, and questioning, universal behavioral norms. The work’s title refers to the familiar figure that attends the event, appropriately dressed, but does not fully participate. In this case, by choice. Placing herself in supposedly ‘normal’ situations in her work, Gilmore then crams and distorts her body into alternative positions. Transferring her accumulated belongings through a hole in the floor to the neutral space beyond it, Gilmore’s treatment of the broken, piled-up mess transforms it into a comprehensive entity. Shahar Marcus unites an iconic, impassioned Biblical text with the military brutality ever-present in Israeli society and human nature. 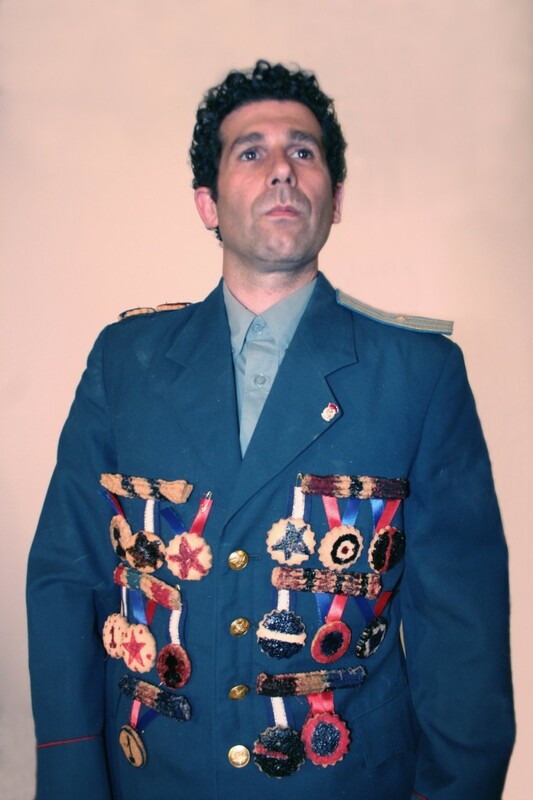 Dressed as a high-ranking officer in an unidentified army, Marcus orates while stuffing the ‘medals’ that adorn his uniform into his mouth. Tearing these ‘medals’ (which are in fact cookies) off one by one, the artist sprays cookie crumbs all over himself while preaching the passage “The fathers have eaten sour grapes…” (Ezekiel: 18). The voracious, desperate act on ingestion is at odds with the expelling motion of speech, an opposition that obliterates any sense of meaning. The performance ridicules cultural preoccupations with hierarchy, power and violence.